Step 1: Using a fork, mix the cream cheese and chives together in a small bowl. Step 2: Place the two tortilla wraps side by side on a flat surface. Spread the cream cheese and chive mixture on the two tortillas, dividing the mixture evenly. Step 3: Pour the kidney beans into a sieve and rinse well. Transfer the beans to a medium mixing bowl and slightly mash them with the remaining ingredients. Step 4: Again dividing evenly, spread this mixture on top of the cream cheese and chives, leaving a gap of approximately 2cm at the top end of each wrap. Roll the tortilla in a sausage shape, starting from the bottom and rolling toward the gap at the top. 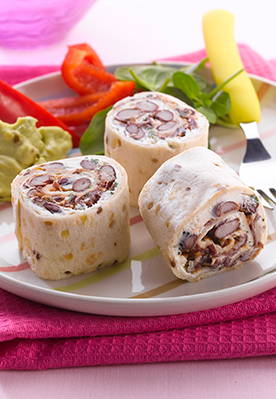 Step 5: Wrap each tortilla in cling film, twisting the ends of the film tightly and refrigerate for four hours. Step 6: Remove the cling film and slice into six or seven even rounds.